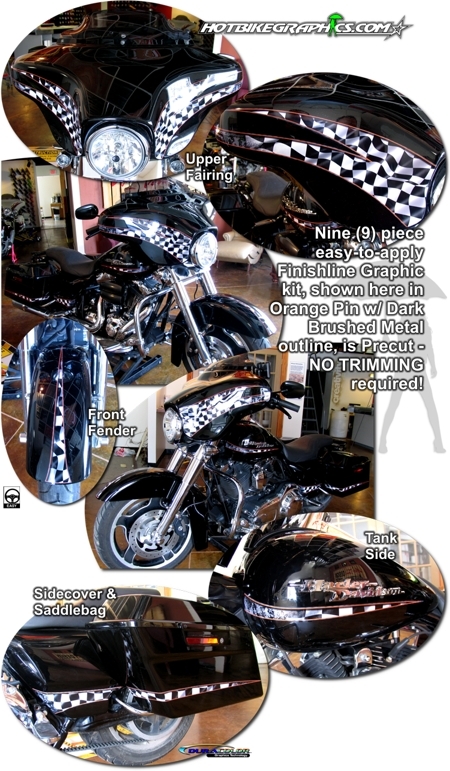 Set your bike apart from the rest with this great-looking nine (9) piece Finishline Graphics kit! Waving Checker Flag inner design element, set on a fading grey-black marbleized background, is bordered by a fine Orange or Burgundy inner pin and a Dark or Bright Simulated Brushed Metal outline. The graphics look so good, you'd think they're factory applied! The Dark Brushed Metal background generally looks great on brighter color bikes while the Bright Brushed Metal suits darker color backgrounds. Digitally printed with our DuraCOLOR graphic technology, high-resolution kit is manufactured with premium motorcycle grade vinyl film materials. As a further step, graphic is covered with a 2.5 mil clear laminate which provides protection from miles of abuse.